IMCDb.org: 1955 Chevrolet One-Fifty Two-Door Sedan  in "Two-Lane Blacktop, 1971"
Il y a eu,à ma connaissance,trois Chevrolet utilisées pour le tournage.L'une d'elles,apres avoir été repeinte en noir,et quelque peu modifiée,a été réutilisée pour le film American graffiti,dans lequel elle est conduite par Harrison Ford. vilero wrote Edited this MOZINOR comment due previous pictures are missed. The 55 in Two-Lane had a big block 454 with aluminum heads, a tunnel ram intake and dual 4bbl Holley carbs. The transmission was a Munci M-22 "rockcrusher' feeding the power back to an Oldsmobile rear axle with 4.88-1 gears. Ruth fitted the car with a straight axle and four wheel disc brakes. The tilt front end was fiberglass as were the doors and deck lid. Ruth also used plexiglass for the side windows that slid back to front instead of rolling up and down. The wheels were American mags 200-s, 15x6 front and 15x10 rear. They used M&H Racemaster drag slicks for racing and Firestone grand prix rain tires for street use. In the movie the car is said to run "well into the 12's. However later in the movie he beats "Mr. Bardahl". I heard the 55 was capable of low 10's at over 130mph! Rumor has it they actually filmed the famed rollover for the end of the movie then cut it out in favor of the movie burning up. Actually one of the few Bel-Airs used in this movie was the same one used in American Graffiti. FamousCars.de please post only thumnails instead of fullsize pics. I'm sorry. Up to now i place litte thumbnail-pics with the link to the big one! Iv never seen this movie b4, I'm watching it right now. It's actully not too bad, alota sweet cars in this movie. Today I was out at the car craft summer nationals in stpaul MN and I was talking to the owner of the last remaining 55 from this movie. He told me that there were only three made for the movie. two of them were two-tens that were turned into one-fifty's. the one-fifty was better known as the businessman's coupe. it was a pretty plain jane car it had no rear seat, stationary rear windows, and not alot of chrome, this car started life as a 6cyl. One of the 3 55's was suposedly used in the rollover scene at the end of american graffiti. As far as them rolling one over for this movie I heard from the owner of the 55 that one of the cars was all set to rollover in the scene where the 55 runs off into the ditch but I guess the director decided not to do that seing as that would mean the end of the movie. this car is listed as a bel-air but from what I learned today it is in fact NOT a bel-air but rather a TWO-TEN that has been turned into a ONE-FIFTY. 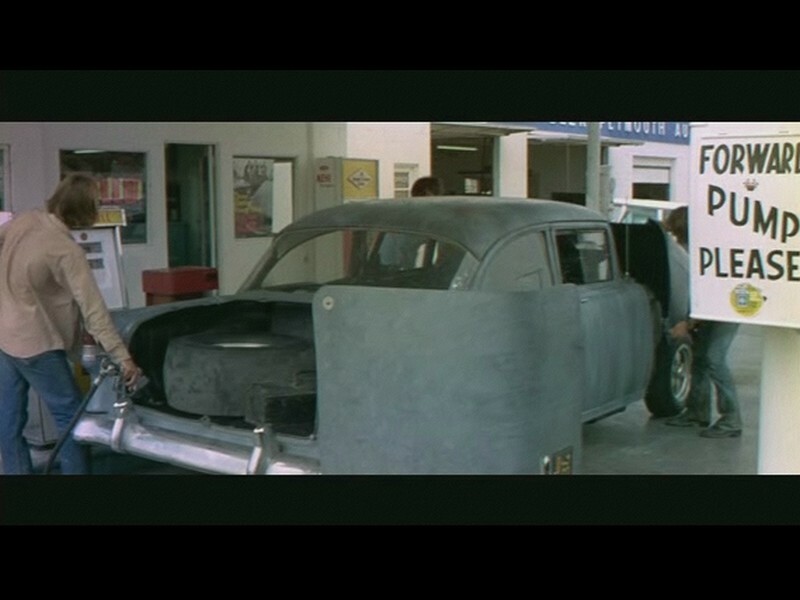 None of the '55 Chevys used in Two-Lane Blacktop were Bel Airs. Bel Airs have stainless trim around the windshield and on the sides of the car. The particular '55 shown above is from a photo shoot that documented its 2005 return to the old Lakeland Raceway in Memphis TN. It was one of three built for Two-Lane Blacktop and the only one not reused in American Graffiti. Although all three appear to be 150 sedans, only two of the three cars were really 150s. This particular car was originally a 210, but turned into a 150 by removing all the body stainless and filling the holes - documented when the car was restored in 2002. If that's not confusing enough - three cars in two movies - yet another '55 was used at the end of American Graffiti as the "burn" car. It was a non-running '55 hardtop with a piece of wood screwed in to make it look like a 2-door post/sedan. antp, the car depicted in the movie was a 150 rather than a 210. As stpaulcarguy states, out of the three cars used (one was a 150), two of them were 210s which were converted to appear as 150s (if you can say that seeing the cars were so stripped). It would be more apt to change the model title to a 150 instead of the 210. Why would they use an Olds rear end with 4.88 gears? The slicks are probably bigger diameter, but with street tires the engine would be screaming at highway speeds and would max out under 100mph. They would have no chance against the GTO on highways. On a 1/4 mile with the big slicks it may make sense but 130mph seems high for those gears. A big block with roller rockers and stiff valve springs may make 7,000rpm but not much more. Also, I got real nervous watching the car spin cookies in the dirt with no air cleaners. Would have been funny if they had left the roll over scene. Maybe George Lucas really wanted to see that 55' roll over. I own a 1955 Chevrolet 4 door sedan that was used for a rollover stunt in a movie. It had a camera mount welded to the frame under the passenger side front fender to shoot the stunt through the headlight. The car had been pretty cut up by time I got it, and I used it strictly for the frame and floor boards in my Nomad, but I kept the camera mount for nostalgia. This came out of a Junk Yard in Arizona, but that's all they told us of her. Wonder if this might have been the 55 rumored to have been rolled here? Would love to see the film shot from under that fender. Flight Risk wrote Why would they use an Olds rear end with 4.88 gears? The slicks are probably bigger diameter, but with street tires the engine would be screaming at highway speeds and would max out under 100mph. They would have no chance against the GTO on highways. On a 1/4 mile with the big slicks it may make sense but 130mph seems high for those gears. A big block with roller rockers and stiff valve springs may make 7,000rpm but not much more. The Olds axle was a staple with the gasser crowd back in the late fifties-mid sixties, simply because it took a lot of abuse, was cheap and could be found with good performance gears. 4.88:1 is a tad (ok, maybe more than a tad) on the high side, but it's entirely plausible in a street race car built specifically for short range work (Ruth allegedly set these cars up as one of his 'real' cars). As for the RPMs... 7k+ in a drag race only engine can be done all day, super stock guys wound 427s past 8, sometimes 9k with stock rods 0_o. Aftermarket pistons (as in lighter), roller cam, good springs and rods/rod bolts will get it done. The 427 would be a better choice, but the 454 can still do it. ‘Two-Lane Blacktop’ 1955 Chevy two-door sedan heads to auction - See more at: Link to "blog.hemmings.com"
Turns up in S4E1 of "Jay Leno's Garage" on CNBC and James Taylor gets to drive. Only fire, if reenacting the final scene with the film melting counts.